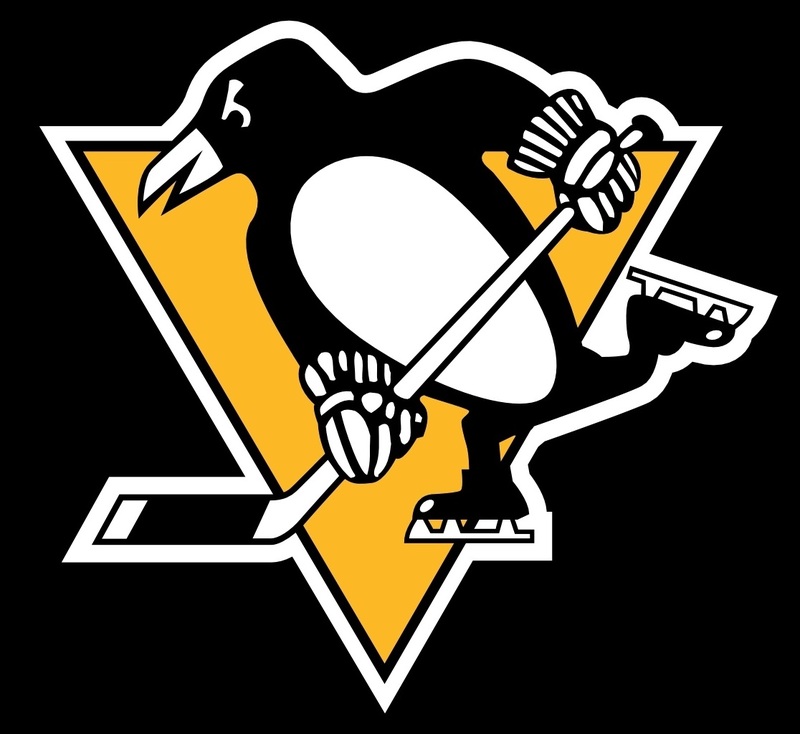 The Pittsburgh Penguins entered the game 44-0 in the regular season and playoffs when leading after 2 periods, and they entered the 3rd period with a 3-1 lead. Washington would force overtime in large part due to a stretch of play that saw the Pens take 3 delay of game penalties in 2:02. But when it seemed like the bottom was falling out, Pittsburgh responded with a strong overtime period that saw Nick Bonino put away a loose puck in front of the net to eliminate the Washington Capitals 4-3. Phil Kessel scored the first 2 goals of the game and added an assist, Carl Hagelin had 1 goal and 2 assists, and Matt Murray stopped 36 of 39 shots in net. The Penguins were looking to get more production out of the top of their lineup entering the game, and Phil Kessel stepped up and answered the bell. Kessel wristed a shot through the legs of Karl Alzner and past Braden Holtby from the top of the left circle to quickly make it 1-0 Pittsburgh. Both teams would trade odd man rushes through much of the first period, but as the 1st period wore on it would be the Penguins getting great pressure in the Washington zone. The first intermission would come with the Pens leading 1-0, but it would be a Brooks Orpik penalty early in the 2nd period that would change the outcome of the game. Patric Hornqvist drew a high sticking double minor from Brooks Orpik to give Pittsburgh a 4 minute power play to attempt to increase their lead. The Pens had gone 1-for-16 on the man advantage against the Caps in the series, but they'd break out in a major way when it mattered the most. Kessel rang a shot off the crossbar on the powerplay early in the power play, but he would later wrap a shot around Holtby to increase the lead to 2-0. The goal would come 40 seconds into the power play, meaning that Orpik would remain in the box as the Penguins started the 2nd two minute power play. And they'd be able to take advantage again as Carl Hagelin redirected an Olli Maatta shot from the point past Holtby to give Pittsburgh a huge 3-0 lead midway through the 2nd period. It would have been wrong to assume that Washington would throw in the towel, and they'd begin to mount a comeback late in the period. The refs would send the Capitals to the power play on a bit of a phantom call with 6 minutes left in the 2nd period after they ruled that Eric Fehr interfered with T.J. Oshie, but the man advantage that powered them to a 3-1 victory in Game 5 with a pair of big goals was unable to get them on the board. It wouldn't take long for Washington to go back on the power play, as minutes later Chris Kunitz was called for tripping Marcus Johansson at the Caps' blue line. This time they were able to take advantage of the opportunity when Oshie ripped a shot past Matt Murray from the right circle, cutting the deficit to a 3-1 Pittsburgh lead heading into the 2nd intermission. Washington would come out for the 3rd period looking to get the next goal up on the board, and Murray made a huge save in the opening minutes on Andre Burakovsky after he deked around Olli Maatta on the blueline and got in on a semi-breakaway. Holtby would make a great glove save minutes later at the other end after Sidney Crosby fed Conor Sheary through traffic for a one-time attempt. The Penguins would do a good job of keeping the play in the Washington zone, and it would lead to Tom Kuhnhackl drawing an Alexander Ovechkin slash along the boards to put the Penguins back on the man advantage. The Pens would have a prime opportunity to tack another goal on the board and give themselves more of a cushion, but Washington was able to kill off the penalty and get back to even strength still down 3-1. It would prove to be a big kill as moments later, Justin Williams would curl around the back of Pittsburgh's net and wrist a shot over Murray's glove hand to make the score 3-2 Penguins. Midway through the 3rd period, the Penguins would go on an unprecedented delay of game spree that had the potential to completely sink their chances in the game. Kunitz would head back to the penalty box after clearing the puck over the glass from the defensive zone, sending the Capitals' power play back out with a chance to tie the game. Things would get even more dire for the Penguins after Nick Bonino swatted a puck out of midair and over the glass, drawing a second delay of game penalty and giving the Caps 54 seconds of 5-on-3 action. They'd manage to kill off the penalty to Kunitz just to see Ian Cole clear a puck from behind the net out of play over the Washington bench. It would give Washington another 5-on-3 advantage, this time for 1:04. This time, the Pittsburgh PK wouldn't be able to hold up, and it was John Carlson with a blast from the left circle to tie the game 3-3. The goal would still leave the Capitals with a 5-4 power play, but the Penguins were finally able to keep the puck in play and return to even strength. With regulation winding down, Letang would be sent off for interference after crushing Oshie in front of the Pittsburgh bench at the blue line as the puck went past. 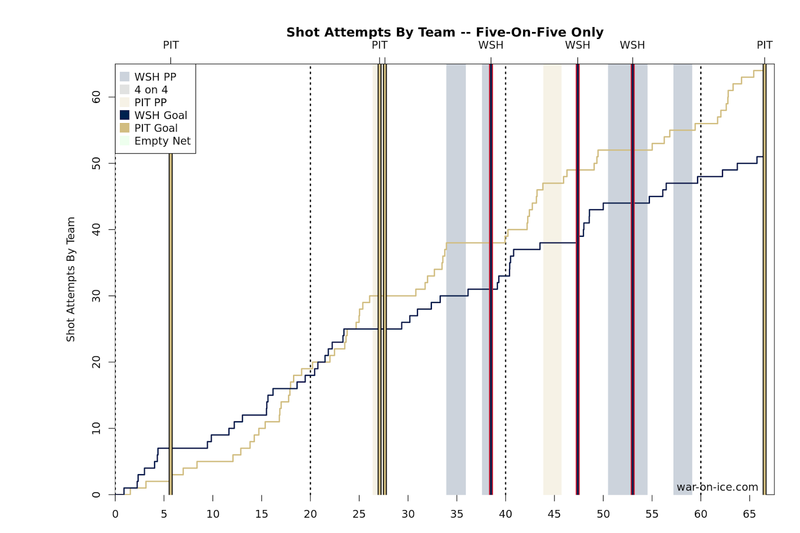 Washington would have a chance to all but wrap up the game with a goal given that the penalty would take up the majority of the rest of the 3rd period, but the Pens were able to buckle down and get the kill, and the game would go to overtime. Pittsburgh would get a great opportunity minutes into the overtime period, first with Trevor Daley having two great shots on net then ending with Jay Beagle diving behind Holtby to knock a sure goal away. They'd continue to drive the play in the overtime period, and finally it would be Nick Bonino backhanding a rebound into the net to end the game and send the Penguins to the Eastern Conference Finals to face the Tampa Bay Lightning. The Penguins would rebound from some poor possession showing in the previous games to thoroughly control the play in Game 6 with a score-adjusted 58.5 CF%. They stepped up in the overtime period too, attempting 9 shots after regulation to the Capitals' 3. Pittsburgh returns to the Eastern Conference Finals for the first time since 2013 when the offense disappeared, scoring only 2 goals in the 4 game sweep at the hands of the Boston Bruins. They'll now face off against last year's conference champions for the right to represent the East for the Stanley Cup.